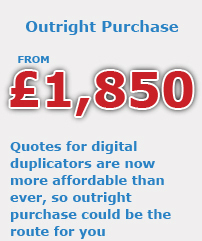 Digital duplicators are designed for high volume print jobs and are able to produce anywhere from 90 to 240 pages-per-minute, while maintaining a cost-per-page that can be as low as 1/4 of a penny. As well as being quick they are also very reliable because they do not use heat or photocopier components, such as toner, instead they use fast drying ink that is also kinder to the environment. When combined with Print Finishing equipment, such as a collator/booklet-maker, a digital duplicator provides the perfect setup for producing exam sheets, classroom materials, newsletters, training manuals, reports and booklets - all at very high speed and low cost. A4 Duplicators: The most popular type of duplicator suited to high volume users who only require a maximum page size of A4 or A5 booklets. They are widely found in schools and businesses of all sizes and used for jobs such as printing stationery and producing training documents and reports. 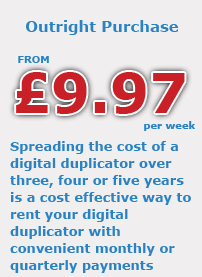 A3 Duplicators: Suitable for printing A4 booklets and posters and can often be found in professional print rooms and often used by political parties. Friction Feed V Air-feed: For the highest volume users, these are models of digital duplicator that use air to feed the paper into the machine. This enables the duplicator to print onto envelopes and carbonless paper for multi-part-sets with ease and accurate registration. Duplex: The very latest models of digital duplicator are able to print or copy on both sides of the paper in a single pass; without re-feeding. This can reduce the time required to print any double-sided print jobs by up to 60% and reduce the cost by 20%. Duplo International is renowned for digital duplicators and professional print finishing equipment and we are proud to say that we are affiliated with their number one UK dealer, enabling us to provide unparalleled pricing and support. 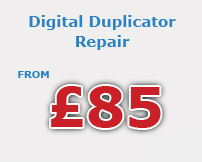 We are unique in having a team of account managers and engineers who are dedicated to providing professional consultation and service on digital duplicators and print finishing. Ricoh manufactures a large range of A4 and A3 digital duplicators including the world’s first duplex digital duplication that is able to print on both sides of the paper at the same time. Ricoh include their familiar photocopier controls within their digital duplicator range.